It was a morning of smiles Saturday at Murfreesboro Park and Recreation’s Miracle Field. 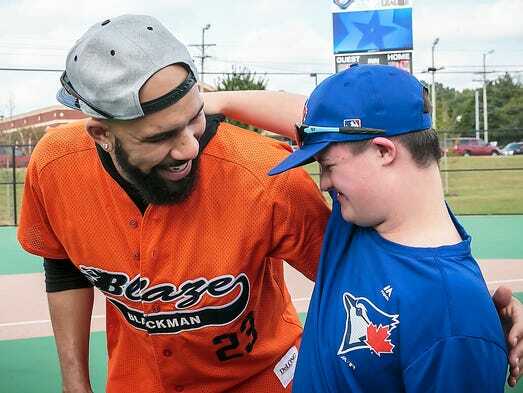 Boston Red Sox star pitcher David Price, a hometown hero, made a surprise visit to the next-to-last games of the season. The former Blackman High School and Vanderbilt baseball standout’s Project One Four Foundation spearheaded fundraising for the $3.2 million park with a $300,000 donation. Miracle Field, which opened in May, features a custom-designed, special rubberized baseball field built for children and adults with special needs, and accommodates wheelchairs and other assertive devices. A buddy system pairs able-bodied peers with the Miracle League athletes. Wearing his former Blaze jersey No. 23, Price, who is a new father, took to the field pitching for a game between Rays and Jays. Then as the Smyrna Elementary fifth-grader was leaving, his day became more exciting. Crouch was one of the first to spot Price in the crowd and made a beeline to him. Price stopped to say hello and autographed a baseball. A silver medal winner in the Tennessee Special Olympics, he threw both arms in the air with excitement. He left the Miracle Field with a new treasure for his trophy shelf and a big smile. For Project One Four, visit www.project14.org or email bonnie@project14.org.